A week or two ago, I wrote about Apple opening the USB-C-to-Lightning cable market up to third parties after a couple of years of lock-in. 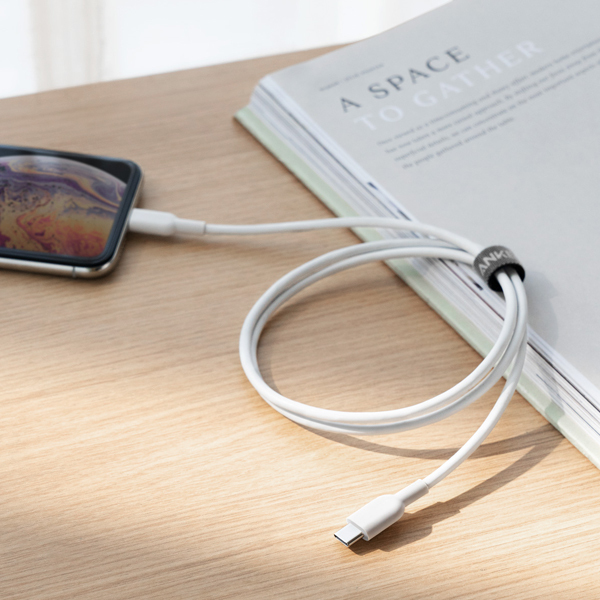 Today I’m back with a quick update on one of the two cables I’ve seen, in case you’re looking to rapid-charge an iPhone 8 or later, or an iPad Pro, with Lightning. Anyway, I got the Anker USB-C to Lightning charging cable in last week. It’s now available on Amazon for $15.99 in white or $17.99 in black, although they are rolling in and out of stock. The cable is in Anker’s PowerLine II highly durable cable line, rated for 12,000 bends. Here you see the Anker cable coiled with the Apple cable, alongside three of the USB-PD chargers I tried it out with. The cable is thicker and looks and feels sturdier than the Apple cable. It comes with a Velcro tie to coil the cable safely, which is a nice touch. One upside to the Apple chargers is that you can find Apple stores (and other retailers like Best Buy and Fry’s who sell Apple products) all over the place. In an emergency, you can pick up a charger without waiting for shipping. I had to do this with an 87W charger to keep my Dell XPS 15 9550 running during a trip to Las Vegas a couple of years ago. The testing was pretty simple. This time, I used the new Klein Tools ET920 tester (chosen because it has a captive USB-C cable rather than the dongle-style connection of the Plugable and Satechi testers). The tester does not cross the streams, so to speak, so to test USB-C output you have to use the USB-C input (same goes for USB-A). I plugged the tester’s USB-C input into each of the chargers shown above, connected the Anker Powerline II cable to the output and to the 12.9″ iPad Pro 12.9″ (2015 model), and watched for the voltage bounce. As you see in the photos, charging started at about 5V/2A, and about 8 seconds later, the voltage jumped to nearly 15V as expected. This was the same behavior as with the Apple cables. This is not a surprising review or result; Anker does cables well, and the chip that makes the USB-C to Lightning rapid charging possible is licensed from Apple. However, I’d have been hesitant to recommend it without trying it out myself. Based on my use of the Anker PowerLine II charging cable, I’m comfortable recommending it, and with a number of Lightning devices in the house, I can always use another charging cable. The Cascade Cables version discussed in the earlier post is expected in April. While they did not yet respond to my inquiry about testing with 28W rapid-charge devices like the iPhone 8 and later, and iPad Pro models with Lightning, it seems likely that they will work. Watch for an update in two months on that. Have you upgraded your Lightning charging options from the ones that came in the box? Any thoughts or questions on charging options? Share in the comments, and I’ll answer if I can. rsts11 turns 8 today. Not the operating system, which is older than your host, of course. Eight years ago today, inspired in part by Stephen Foskett and the Tech Field Day crew, I started what was probably my third attempt at blogging. Two weeks later I wrote a post loosely based on Tech Field Day 5 (which I attended a small part of–mostly the party), and a happy post about getting a 48 port 3COM switch and going back to Windows XP to upgrade its firmware. Today I’m back to attending the TFD parties only; after 5 stints as a full delegate and 7 of what’s now called TFD Extra, I went over to the dark side in 2014, working for a vendor, and my delegate page progress is on hold for now. As you may know, I branched out into the royal plural on the travel blog just over two years ago; rsts11travel still hasn’t found a better name, and I haven’t gone Sinclair on rsts11 itself either. I have a modest backlog of posts for rsts11 this year, as well as a couple of recent eBay acquisitions to write about (including a whole new home network infrastructure), so despite working for a Fortune 50 company that makes a lot of the hardware I would have written about in the past, there’s still a lot to cover. Stay tuned in 2019 for more coverage of tech new and old, continuation of the POHO (Psycho Overkill Home Office) theme that’s driven the blog for eight years now, and some more quick takes and soft topics to push us along into what may be the Year of VDI, the Year of the Linux Desktop, or the Year that Marketing Listens To Tech. I seem to have volunteered to share this documentation… if I run out of other things to do, I might do a video or animation of the process. But in short, here’s how I would go about setting up and managing a blogroll (list of blogs to share) on a wordpress.com-hosted WP blog. Note that you have to have administrative privileges to the account (as far as I know) to make this sort of changes. Also note that I’m not responsible for any damage you do to your blog, your home, your horse, or your hometown while following these steps. If you’re already in the <yourblogdomain>/admin interface, look on the bottom left of the screen for “WP Admin” which will take you to the same place.